Ribbons are automatically placed in correct order regardless of order selected on form. Use the comment section at checkout for additional ribbon attachment instructions. We begin with a blank, Made in the USA, premium wool blend cap and do the embroidery right here in Maple Grove, MN. Additional product photos are available on our Facebook page. All of our custom hats begin with a MADE IN THE USA premium wool blend five-panel hat. The hats are one-size-fits-all with an adjustable two-piece cloth Velcro strap. The hats fit sizes up to 7 and 3/4. - American Flag OR Text (3 lines, 11 characters max per line). Gold Braid Decorative Leaves aka "Scrambled Eggs"
Eggs-1 = Decoration on civilian apparel and do not denote officer rank in the military. Eggs-3 = Denote flag or general officers (O-7 rank and higher). All embroidery is done directly to the hat right here in our Maple Grove, MN headquarters. Options for embroidery are shown in the drop down menus in the options section above. If ribbons are being embroidered on the hat, we automatically place them in the correct order of precedence. THE PICTURE IS ONLY AN EXAMPLE; ALL TEXT EMBROIDERY MUST BE REQUESTED IN THE FORM SPACES ABOVE. If a box is left blank, no text will be embroidered in that space. 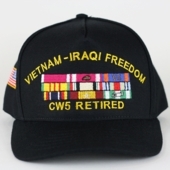 Lettering to the left and right of the center emblem is as you are looking at the hat. Text on the side panels of the hat is as you are wearing it -the left side panel is over the left ear and the right side panel is over the right ear. We do our best to ship every custom embroidery order within three weeks (15 business days) of the day it was ordered. We make all hats in the order they are received regardless of shipping method selected. Occasionally during the year and especially during holiday seasons such as Christmas, Father's Day, and Veterans Day, we receive more orders than we can fill within our typical three week time frame. If you need an item by a certain date, it is best to call us to see if we can fill the order by the date needed. We are able to embroider most ribbon attachments. ATTACHMENTS MAY BE SLIGHTLY LARGER THAN ACCURATE SCALE. Embroidery of attachments has to be done on top of the embroidery for ribbons. Trying to embroider tiny stars onto the ribbons can ruin the hats by trying to put too much thread in a small space.